The Chelsea Laundry is a boutique dry cleaner whose business is the collection and delivery of bed linen, dry cleaning and laundry directly from your home – or office. The most important thing to remember about The Chelsea Laundry is that there is no travel required, or indeed any need to lift a finger as a customer. Just make a booking to have your laundry collected at a time and place that works best for you, and we will come to you with a smile on our faces and determination to do the best job possible! One of our vans will arrive at your doorstep and collect everything that you need, and from there we’ll provide a very thorough and efficient dry cleaning process at our own premises, located close to Chelsea Bridge. We provide our services to a very exclusive clientele in and around Chelsea, with many of our customers making repeat bookings week in and week out. Making a booking with The Chelsea Laundry really couldn’t be any easier. Our drivers are servicing customers in the area each and every day, ensuring that we will come directly to you at your convenience. We’re able to provide a quick turnaround if necessary, so don’t worry if you have noticed a previously-unacknowledged stain on your favourite shirt or dress, or a clumsy house guest has spilled red wine all over a white or cream sofa cushion. The Chelsea Laundry are here to help, whether your needs are an emergency or something considerably more relaxed! When the time comes to make a booking with The Chelsea Laundry, you have two options. You’re already online and visiting our website, so why not just click here and fill in the booking form provided? Alternatively, you are more than welcome to send us an email using the address bookings@thechelsealaundry.com, or to give us a call on 020 7501 1841. Our friendly and knowledgeable staff will be delighted to speak with you, answer any questions you may have and ensure that you receive the best possible service for your needs! You’ll find vans servicing customers around the Chelsea and Belgravia areas daily from Monday to Saturday, from as 6am until 12noon. At present, The Chelsea Laundry does not offer a Sunday service. 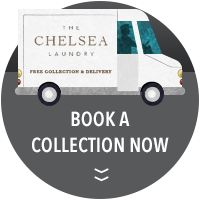 The Chelsea Laundry and Dry Cleaner provides a quick & convenient door to door pick up and collection service in London. It’s a common problem for a great many individuals and businesses in London. Laundry is required – whether that takes the form of a designer suit or dress that is dry clean only, formalwear ahead of a hugely important event, a substantial number of sheets and linen for a hotel or B&B or even an emergency clean following a coffee spillage ahead of a major meeting – but many laundry services are open from nine to five. This makes finding the time to visit in the middle of a working day is almost impossible, and drastically reduces your options when it comes to laundry. The Chelsea Laundry and Dry Cleaner understands this difficulty only too well, and provides a business model that will solve these problems with an absence of inconvenience. We provide a fast and convenient pick-up and collection service in London, ensuring that your laundry needs are taken care of without needing to step outside of your own front door. Whatever your requirements, The Chelsea Laundry offers a high-quality service by experienced professionals for a truly door-to-door experience that enables clients to forget all about the frustrations of waiting in line at high street laundrettes. Our collection and delivery service is currently available in Chelsea, Kensington, Fulham, Belgravia, Notting Hill, Mayfair and central London. For the avoidance of doubt, when we promise a door-to-door service that’s exactly what will be provided. We will collect your laundry and dry cleaning directly from an address that you provide, whether that’s a residential or business address, and return it to the very same location at a mutually agreed time. It’s simplicity itself to get your laundry taken care of by our high-end service; just fill in the booking form located right here on our website, arrange dates and times for collection and delivery that suit your busy schedule, and we’ll take care of the rest while you relax. You can rest assured that your precious belongings are in safe hands, too. Our mobile dry cleaning service is even backed by our Quality Guarantee. We strive to offer the finest and most reputable dry cleaning and laundry collection service in London, and every action that we take is made with this aim in mind. All garments and linens are inspected on arrival for any stains and repairs that may be required, and are then treated and mended as necessary – all before the thorough and professional cleaning process even begins. All clothes and linen will then be expertly wrapped for delivery on a daily basis throughout Chelsea, Belgravia and central London, ensuring that they are returned in a timely fashion, looking, feeling and smelling as fresh as when they first left the shelves of the manufacturer. The Chelsea Laundry can also offer a shoe repair service for when those treasures heels and brogues start to break down upon you. Just get in touch to discuss this, and to see how we can help. If it’s simply traditional dry cleaning that you need, however, you will find a raft of reasonably priced options that will take care of your formal or business clothing and linens – with the latter including such large-scale requirements as curtains right through to the small but essential touches such as napkins. Rest assured that our expert cleaners have tackled all kinds of stains and returned the garments looking as good as new, and we will always endeavour to ensure that you are 100% satisfied with the service that we provide. If, for any reason, we are unable to return a garment in perfect condition we will be sure to discuss that with you. Many of our customers enjoy a regular collection, potentially once or twice each week, to coincide with housekeeper routines, but the decision is yours. Remember, flexibility is at the heart of everything that The Chelsea Laundry provides. This even includes our billing policy – you will be invited to open an account and settle up any laundry bills on a monthly basis, or simply pay as you go. Perhaps best of all, the minimum order is just £25 and no hidden charges pertaining to the collection or delivery of your goods, so there’s no need to save up stacks of laundry waiting to make the collection worth your while. You can choose what you would like cleaned, when you would like it collected and returned, and how often this is the case. Simply tell us what you need, and relax while we take care of the rest.